Is My Asthma Work Related? We aim to cover the full range of questions you may have in relation to occupational asthma ranging from causes and high risk professions associated with the condition, how to spot the symptoms of occupational asthma, how the condition can be treated, what your employer should be doing to lessen risks and how you can go about helping to prevent the condition from occurring. Occupational asthma is asthma that has been caused directly as a consequence of a persons’ working conditions. In terms of the differentiating between asthma and occupational asthma, there is no difference in the actual symptoms suffered, it is simply the case that occupational asthma is a form of asthma that was caused by respiratory sensitisers in the workplace. 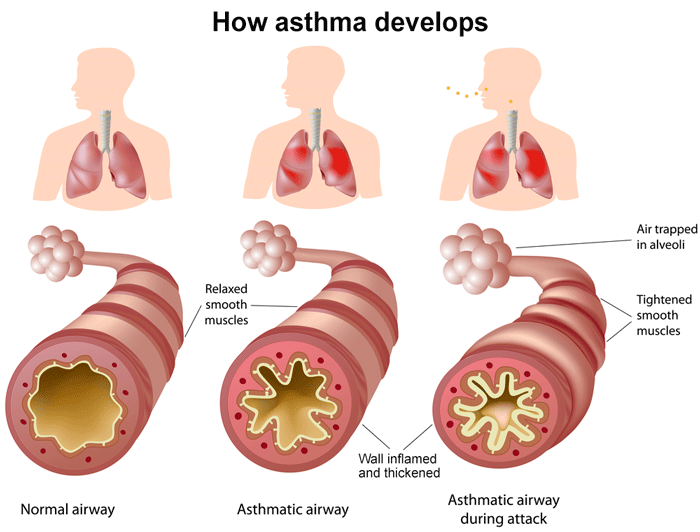 Asthma affects a persons’ breathing and can develop almost overnight, over a period of weeks, months or even years. The time depends on the health and genetics of the person involved, the type of substance involved (sometimes called respiratory sensitiser) and the amount and duration of the exposure to the substance in the workplace. Sufferers frequently have symptoms such as persistent coughing, wheezing, shortness of breath and a tightness of the chest. There can be numerous triggers that can make the condition worse and once a sensitiser has been diagnosed as the cause of occupational asthma, that substance will continue to affect the sufferer whilst in contact, although post-diagnosis it is possible to manage exposure to the substance and also use medical treatments to ease the symptoms. In the UK the Control of Substances Hazardous to Health (COSHH) Regulations is an important regulation that is aimed at enforcing employers to control the exposure to hazardous materials and promote the good health of employees. The number of cases of occupational asthma has been in a steady decline in recent years, no doubt due to strong enforcement of regulations such as COSHH, but there is no room for complacency as occupational asthma can prove to be a debilitating illness that can affect a sufferer significantly both in their private life and working career. As with all industrial diseases early diagnosis is key so if after having read through this website you are anxious that you or a friend or relative might be showing the symptoms of occupational asthma it is important that you consult with a suitably qualified medical professional as soon as possible to discuss your concerns. Mercury Legal Online is a trading style of Gallium Legal LLP, registered in England and Wales, number OC344863. Registered office: Gorse Stacks House, George Street, Chester, Cheshire, CH1 3EQ. Gallium Legal LLP is regulated by the Claims Management Regulator in respect of regulated claims management activities; its registration number CRM26759 is recorded on the website: www.justice.gov.uk/claims-regulation. Gallium Legal LLP's panel members are solicitors of England and Wales and authorised and regulated by the Solicitors Regulation Authority (SRA) - www.sra.org.uk. The advice they give is impartial and confidential. You are free to choose another solicitor.